Group recommender systems are information filtering and decision support applications that are aimed at aiding a group of users in making decisions when they are considering a set of alternatives. State of the art solutions aggregate users’ preferences acquired before the actual decision making process and suggest items that fit the aggregated model. However, it has been shown that the recommendation needs of groups go beyond the identification of such items, and it is essential to take into account, in the recommendation process, the dynamic of users’ interactions in their real group context. In this paper, we therefore illustrate a novel approach to group recommendation, which is implemented in a mobile system, that monitors and exploits users’ interactions during a group discussion, and offers appropriate recommendations as well as other types of suggestions, to guide and help the group members in settling on an agreement. We have carried out a preliminary user study of the proposed approach to assess and analyze the usability of the system along with the perceived recommendation quality and choice satisfaction. The results of this study are encouraging as they show that the proposed approach attains a high usability score, and has good user-perceived recommendation quality as well as choice satisfaction. 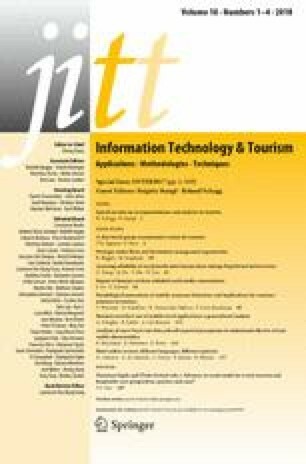 This paper is an extended version of our conference paper with the same title previously published in the proceedings of Information and Communication Technologies in Tourism 2017 (ENTER 2017) which took place in Rome, Italy, January 24–26, 2017.